This post draws on a PRIF Spotlight (in German) by Annika Elena Poppe and Jonas Wolff and was first published as a commentary on the website of the International Consortium on Closing Civic Space (ICon) housed at the Center for Strategic & International Studies (CSIS). It has been reposted on the EDP Wire of the Research Network External Democracy Promotion (EDP). It is not here to suggest that Germany is – or might be – joining the group of countries around the world in which dissident organizations are harassed by tax investigations, spied on by intelligence services, criminally pursued by public prosecutors, or physically threatened by parastatal actors. However, the ATTAC case could seriously undermine the credibility of the German government that usually presents itself as an unconditional champion of the rights of freedom of assembly and association in Europe and around the world. Given that the ATTAC case has crucial similarities with the means and effects of much more severe restrictions elsewhere, it legitimizes the arguments of those who would gladly limit civil society actors to “non-political” forms of social engagement. Germany, and especially its federal government, is therefore sending a highly problematic signal to the world. For many years, the local tax office in Frankfurt recognized ATTAC Germany as a nonprofit organization serving public-benefit purposes without objection. In spring 2014, however, ATTAC received notice that its public-benefit status had been revoked retroactively as of the year 2010. In justifying this decision, the tax office argued that ATTAC pursues activities of political nature beyond its prescribed public-benefit purposes that, in line with Germany’s Fiscal Code, qualify it for the tax privileges. It cited ATTAC campaigns for financial market regulations, a tax on financial transactions (the so-called Tobin Tax), and a capital levy. As a consequence, the organization was no longer authorized to issue receipts for donations, and supporters could not deduct donations from their taxes, which in turn deters individuals’ contributions to ATTAC (information about the lawsuits and positions, and downloads of the various notifications and judgments – all in German – can be found here). 21 months later, the tax office rejected ATTAC’s appeal, and the organization filed a lawsuit. Finally, in November 2016, the Hessian Tax Court in Kassel ruled in favor of the organization, confirming the public-benefit nature of both the NGO’s statutes and its management. The court viewed ATTAC’s political activities as a legitimate means to reach its official objectives. An appeal was not permitted and the case appeared to be closed. However, the Federal Ministry of Finance intervened and instructed the local tax office to complain about the denial of appeal to the Federal Fiscal Court. Should an appeal be allowed, the proceedings could last three more years. Further, as long as no decision is made, ATTAC cannot issue any donation receipts. The German case of ATTAC has important parallels to the financial obstacles and challenges that vulnerable civil society organizations around the world face. In countries of the global South, laws often specifically restrict access to financial support from abroad. In the case of Ethiopia, for instance, NGOs that receive more than 10 percent of their funding from foreign sources are prohibited from engaging in a set of political activities, including “the advancement of human and democratic rights.” Western governments, and especially Germany, criticize such laws, pointing to civil society’s political engagement as a fundamental human right. In principle, the German government has the same view on the civic engagement at the domestic level. During a public hearing of the parliamentary subcommittee on “Civic Engagement” on March 22, 2017, a Deputy Department Head of the Finance Ministry emphasized that civic involvement is always political. However, as the case of ATTAC clearly shows, the German Fiscal Code is not in line with this viewpoint. As the Fiscal Code Application Decree (Anwendungserlass zur Abgabenordnung) explains, “political purposes (influencing the formulation of political opinions, supporting political parties, etc.) are not considered to be public-benefit purposes according to Section 52 of the Fiscal Code.” In applying the Fiscal Code, the challenge for German tax offices remains to assess whether the political activities of a given NGO are in line with an accepted public-benefit purpose, or they indeed imply that the organization illegitimately pursues political purposes. Whether an organization is awarded tax privileges and whether it is allowed to receive foreign funding are two different matters. However, there is a crucial analogy to be highlighted here. Like many NGOs in the global South that receive hardly any local donations or membership dues and therefore rely on international support, organizations in countries in the global North like Germany often depend on tax-deductible contributions from their supporters. For example, as much as 90 percent of ATTAC Germany’s budget comes from donations and membership dues that count as donations. This funding model is based on donors being able to deduct their financial support from their income taxes – which precisely depends on the civil society organizations’ status as a public-benefit organization. 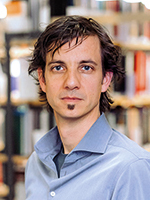 Stefan Diefenbach-Trommer, director of “Legal Security for Formulating Political Demands,” an alliance of German civil society organizations, is therefore not exaggerating when he stresses that the legal battle is about ATTAC’s “survival.” The legal gray area in the German Fiscal Code also functions in a similar way to the intentional prohibitions of political activity in NGO laws seen in autocratic countries. As the case of ATTAC demonstrates, German NGOs that engage in political activities may at any time be classified as “too political” by “the State”. As a consequence, the interest to ensure one’s own funding can lead German NGOs to self-censorship, as witnessed in many parts of the world. Internationally, the German government supports a broad interpretation of the human right to freedom of association as advocated, for instance, by the former UN Special Rapporteur on the rights to freedom of peaceful assembly and of association, Maina Kiai. According to Kiai, the right to freedom of association as guaranteed by the 1966 International Covenant on Civil and Political Rights includes a right to far-reaching access to resources, including finances, regardless of whether they are from foreign or from domestic sources. NGO laws that block or restrict access to foreign funding for organizations active in politically “sensitive” areas are, therefore, seen as violations of international human rights law. By analogy, the same reasoning could be applied to a law that limits NGOs depending on domestic donations to supposedly “non-political” activities. 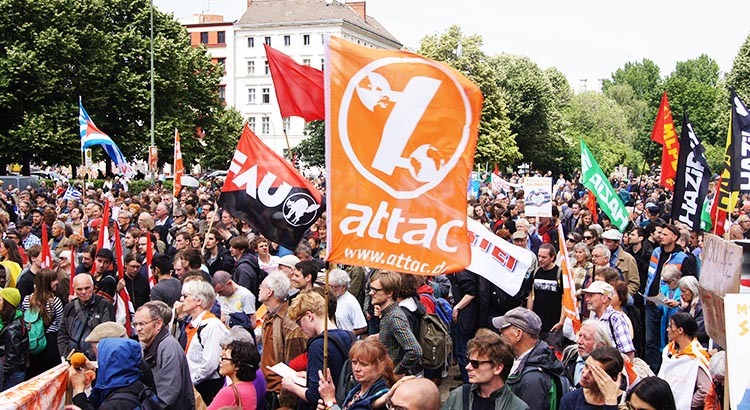 The German Ministry of Finance denies that the case against ATTAC is politically motivated. It claims that because the case is of “fundamental significance,” it requires a “decision by the highest courts.” Governments that restrict civic space typically refer to general standards and legal principles to justify restrictive actions. It is impossible to say whether the German government is indeed driven by such abstract legal reasoning or whether this is only a pretext for hidden political motives. Regardless of the government’s true intentions, the consequence of the Ministry of Finance’s intervention signals new dynamics—a fundamental politico-legal issue is to be resolved through judicial proceedings that would directly threaten the survival of an organization that regularly criticizes the government’s policies. The government shows no reluctance to jeopardize ATTAC’s existence by losing its tax privileges for yet another three years. Moreover, if the German government’s intention really aims at clarifying the legal definition of public-benefit purposes so that civil society organizations in Germany can safely and legally engage politically, there is an alternative way to reach this goal: a reform of the Fiscal Code. There are a number of proposals for reforming the Fiscal Code that were advanced, including one from the above-mentioned alliance “Legal Security for Formulating Political Demands.” However, when the Finance Ministry’s spokesperson emphasizes the need to clearly differentiate between public-benefit and political goals, suggesting that political activity has to be subordinate to the (somehow non-political) tax-privileged purposes, it signals that the government might not be in fact willing to allow civil society organizations to freely engage in political activities. Be that as it may, with the Finance Ministry’s push to have the Federal Fiscal Court settle a political debate at the expense of an organization’s survival instead of having it resolved in Parliament, the German government undermines its own efforts to defend civic space beyond its borders. Annika Elena Poppe and Jonas Wolff are also authors of a recent article on the issue of closing space published in Contemporary Politics. 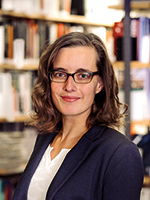 Annika Elena Poppe is project director at the Peace Research Institute Frankfurt (PRIF) and coordinator of the German research network “External Democracy Promotion (EDP) ”. Jonas Wolff ist Vorstandsmitglied der HSFK und leitet den Programmbereich „Innerstaatliche Konflikte“ der HSFK. Er forscht zu Demokratie und politischem Wandel, sozialen Protesten und Konfliktdynamiken sowie zu außen- und entwicklungspolitischen Fragen mit Fokus auf internationale Demokratieförderung. Sein regionaler Schwerpunkt ist Lateinamerika.